Sarah was traveling and staying close by MES. She found MES brochures at her guesthouse and follow the map to MES. She loves singing and can play guitar quite well and ukulele. She visited MES for an hour in the afternoon and interested to see the evening classes. At MES she helped both ukulele and guitar students with their lessons. The kids were very excited to practice with her. Thanks Sarah! 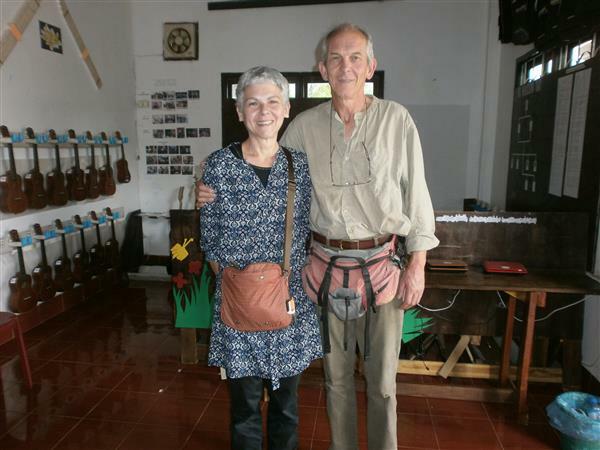 These are Alain and his wife from France, and stopped at MES on their way to Taohai temple, next to MES.